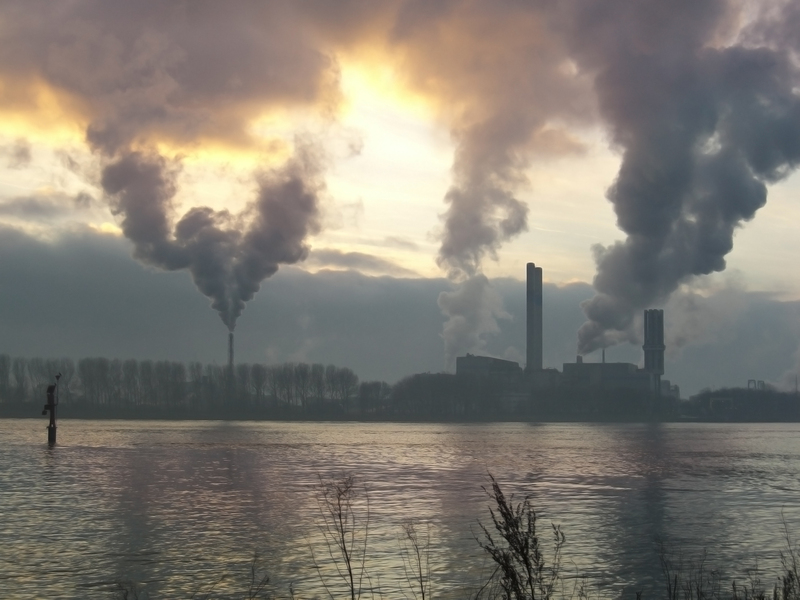 The activity of the Thematic Group “Atmospheric pollution in urban and industrial areas” is aimed to evaluate the quality of air in anthropic areas. This goal is obtained by studying real cases in various geographical areas and by developing and using specific techniques for the evaluation of the chemical composition, concentration, size distribution and sources of atmospheric pollutants, particularly as far as particulate matter is concerned. The research activity includes the development and validation of techniques for active and diffusive sampling of pollutants and for evaluating the size distribution of PM (multi-stage impactor, particle counters and sizers), as well as of analytical methods employing chromatography, XRF, ICP, thermo-optical and thermo-gravimetric analysis, optical and electron microscopy, advanced techniques for the measurement of aerosol components in real time (AMS). The Area has developed and applies an integrated method for the determination of all macro-components of atmospheric particulate matter, including bioaerosol, which allows the attainment of mass closure. When studying real cases we evaluate the spatial distribution of pollutants and the time variation of their concentration (daily, seasonal, long time), which are interpreted according to the meteorological situation. In particular, the link between air quality and mixing properties of the lower atmosphere is studied on the basis of natural radioactivity monitoring. Main pollution sources are evaluated by applying multivariate analysis techniques (FA, PMF, PCA, APCSA, LDA). Field studies are carried out in urban and suburban areas (traffic emission, domestic heating, indoor pollution, regional scale pollution and long range transport contribution, strength of natural sources) and in industrial sites (impact of power plants, incinerators, industrial plants). Current studies include the development of techniques for the quantitative evaluation of primary bioaerosol, the study of the thermal behavior of atmospheric particulate matter, the evaluation of water amount on PM, the study of the link between PM and respiratory health. Studies on air quality are made to measure pollutant species, evaluation of changes in time and space of their concentration and the estimation of the sources. ability to perform tests and investigations both laboratory and field. The Thematic Group activities provides, as part of analytical chemistry, method development, even automatic, for the identification and dosage of organic pollutants present in the emissions of some industrial sectors and in ambient air; through the evaluation of chemical and industrial processes we will study of technological processes and abatement systems useful to break down the organic and emerging pollutant emissions, as well as the development of monitoring systems to continuously toxic compounds. Among emerging contaminants (EOC) Special attention will be paid to the illicit psychotropic substances (cocaine, cannabinoids). The drugs will be monitored jointly regulated pollutants (BaP, PAHs) and will study the spatial and temporal modulations. Tests will be made on the presence of phthalates and studies to standardize a method for the monitoring of BaP and PAHs. PAHs in indoor air will be studied. In order to control and reduce the emission of particulate matter, it will be in-depth knowledge of the absolute and relative contribution from emissive sources, evaluating the distribution of the concentration and the particle size both in terms of mass of that number. In addition, it is active participation of the RPGs to national and international standardization bodies on methods of organic micro-pollutants. Through their research, the Thematic Group aims to deepen understanding of chemistry and environmental quality of life (indoor and outdoor, private and public spaces), in reference to municipalities and new pollutants (PAHs, drugs, EOC PCDD / F, DL-PCBs, nanoparticles), to identify the sources of these and evaluate their effects. Sufficient knowledge of the pollution rates to drugs is a necessary condition for groped the index the prevalence of abuse through environmental measures. The identification of specific pollutants and diagnostic relations between congeners helps to estimate the fallout of toxic and harmful emissions on the environment in small, medium and large scale. In the context of crafting European legislation, the acquisition of information about pollutant dynamics and processes in different environmental ecosystems becomes essential. In particular, it is important to collect information and how the various pollutants behave as the move across water-atmosphere-soil-snow-ice interfaces, and across various spatial scales. Particular attention is given to the range of phenomena relating to the exchange processes of specific pollutants (ie, Hg, NOx and HONO), and how those pollutants move between the atmosphere and water/snow/ice interfaces, a process that affects atmospheric composition on both regional and global scales (especially in Arctic and Antarctic areas). Therefore, studying and understanding these processes has become essential to characterizing the biogeochemical cycle of each, and to evaluating how ecosystems maintain a delicate balance. This balance is often prone to disruption by human activity, sometimes with consequences for public health. This research group is broadly interested in advancing our understanding of the chemical and physical mechanisms that govern micro-pollutant cycles of Hg, NOx, VOCs, and other pollutants of interest to the international scientific community. In the process the CNR-IIA has strived to develop both European Projects/Programs and International Agreements, and it has played a leading role in the “Global Mercury Observation System (GMOS), the Project PEA 2010-2012 (PRODEF_09_113) “Investigation on Chemical and Physical Processes That Affect the Cycle of Atmospheric Mercury in the Polar Regions,” and the UNECE-LRTAP, GEO-Task HE-09-02d, AMAP. Our research team has the skills and experience necessary to coordinate National, European, and International research projects relevant to our area of study. Results from the studies we have conducted have been published in ISI journals, and have been featured as chapters in international textbooks. Our core competencies include: studying the chemistry of Hg, reactive nitrogen and halogen compounds, and carbonyl compounds (formaldehyde, acetaldehyde, acetone); characterizing organic particulates; determining Hg species fluxes and mass-balances as they move across various surfaces; studying transport turbulence at the interface of the atmosphere and other ecosystems; applying micro-weather flow-measurement techniques for NOy, Hg0, CO2, O3, CH4 and the VOCs; studying phenomena related to ozone depletion; studying photochemical processes and behavior in relation to greenhouse gases and global climate change; developing innovative techniques for sampling and analysis; determining the chemical and physical properties of snow, in relation to production and/or deposition of chemical compounds of interest; creating databases, and, more generally, managing data and metadata. Our main area of research has been focused on the following: defining background levels for the various species of Hg, NOx, OVOC/VOCs, and aerosols in different matrices, studying their complex physical-chemical mechanisms and the qualitative and quantitative parameters characterizing the reactions involved in their distribution; and investigating their mass transfer across air / water / snow / ice interfaces, on both a regional and global basis (including polar areas). This general focus is manifested in specific studies that have focused on Hg chemistry in the atmosphere, nitrogen species, halogens, aerosols, solar radiation, the chemical-physical characterization of snow, and organic compounds (VOCs and OVOCs – the latter of which has been of particular interest for its role in reacting with carbon radicals to form O3 in polar areas (ie, OH, and NO3). Studying snow’s radiometric properties at visible and infrared wavelengths to define specific surface areas. Study of the dynamics of pollutants in various environmental ecosystems and their mass transfer to the atmosphere-water-soil-snow-ice interfaces on a regional and global scale. The release of pollutants into various environmental compartments upon human activities is inducing strong modifications in ecosystems, by affecting climate, biomes and humans’ health. The detection of pollutants in distinct environmental compartments (i.e., the contaminants causing toxic effects on living organisms), of their concentrations and fate and therefore the monitoring over time of such parameters, are essential tasks in the assessment of risk exposure of humans and of possible consequent damages to human health. Hence, the monitoring of environmental pollutants has become an imperative need to our society, at both urban and rural level. Therefore, the urgency for monitoring systems more flexible than traditional ones has arisen, since the latter are expensive and often impossible to use, despite their high accuracy and precision, in applications where miniaturization and observation of large areas are required. Additionally, most of the traditional analytical systems do not permit low-powered continuous monitoring. At the same time, the need to develop observational systems on both continental and global scales, in order to collect data to support the European directives and treaties and international programs on environmental pollution (i.e., UNECE-LRTAP, Minamata Convention, UNEP, GEOSS, Earth Cube), as well as the necessity to reduce the costs for investment and operation, urged the scientific community to develop advanced sensors for monitoring environmental pollution. All activities are supported by ongoing projects and national and international partnerships. 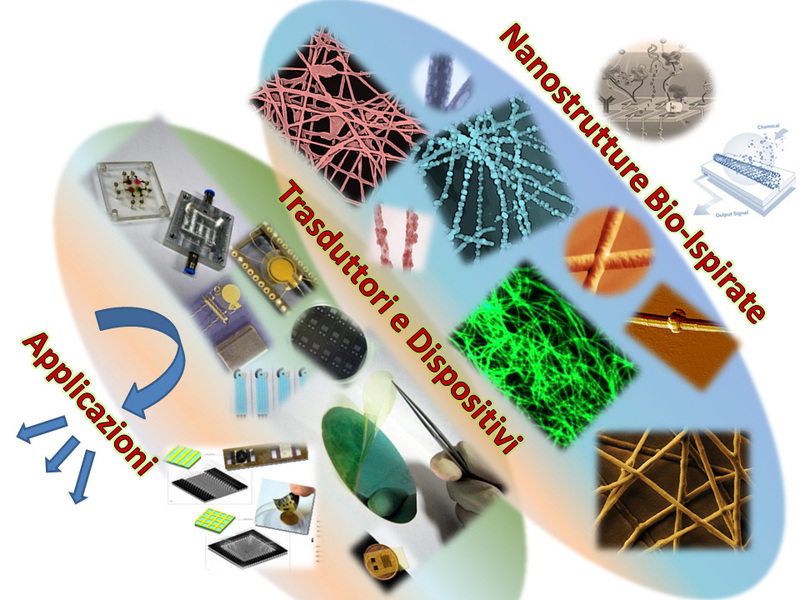 Design and development of nanostructured sensors and multiparameter sensor devices for monitoring real-time and in-situ of gaseous toxic air pollutants and particulate matter. The Modelling Thematic Group employs computer modelling software tools to aid in the Interpretation, Interpolation and Prevision / Forecast of Atmospheric Air Quality Parameters, and also uses these methods to investigate future Air Quality scenarios which may result from changes in climate or pollutant emission patterns. The modelling techniques used vary in their temporal and spatial application. They range from models which are used to investigate chemical processes which occur in aerosol or cloud droplets and include very detailed descriptions of gas and aqueous phase chemistry, to global scale models which are used to investigate long-range (intercontinental) transport of pollutants and their precursors. In between these two extremes we have models which simulate regional (country to continental) scales, as well as models which can be applied to specific areas such as urban scale models. Besides these dynamical models, there is an activity of development and application of neural network models to climatic attribution and impacts, to downscaling (even for obtaining local future scenarios), and to forecasts of physical parameters in the boundary layer. Models are used in conjunction with observations in order to identify the phenomena (chemical and /or meteorological) which influence air quality. Models which successfully reproduce observed air quality parameters can be used to predict those same parameters in areas not covered by measurements. Once a model has been verified against an extensive (temporally, although not necessarily spatially) series of data, it can be used to predict future air quality (a chemical weather forecast), usually for periods associated with normal weather forecasts. A model which has been shown to be reliable can be employed to investigate air quality for scenarios in which climatological parameters have changed, or pollutant (and precursor) emissions are increased or decreased. In a complex system such as the atmosphere modeling allows us to do “experiments” that in reality we could not do and increase our knowledge. Earth Observation (EO) is an advanced technology often used to understand atmospheric, terrestrial, marine, and coastal ecosystems. Many in the international scientific community have called for an expansion of EO technologies: to monitor the quality of other data, to improve existing OT equipment and to maximize the information that is available remotely. These goals were outlined in the guidelines of the Group on Earth Observations / Committee on Earth Observation Satellite (GEO / CEOS QA4EO, 2008). Drawing on years of expertise and experience developed at the IIA, this research area aims to integrate multi-platform and multi-sensor OT data to monitor and improve the knowledge of the landscape and the impact of human activities on the environment. The scientific interest is devoted both to mediterranean and polar areas in wich OT data represent one of the main input in climate change models. The researchers are also particularly interested in the atmospheric component of the OT data. In this context, the activity is devoted to the development of algorithms for atmospheric correction of the remote sensed images. The researchers of this thematic area have gained experience in the acquisition of field data, in the spectral range of the visible and near infrared, to support and validate OT. In this framework were developed skills both on the study of the radiometric response of the different surfaces, natural or atrophic origin, and on the study of radiative transfer in the atmosphere.. The data acquired in the research programs are collected in special geo database connected with appropriate Geographic Information Systems (GIS). In the last 20years, the IIA, had run the hyperspectral sensor MIVIS, dedicated to the integrated management of the territory. In this context, the IIA works together with the Public Administrations monitoring the territory and realizing thematic maps to support decision-making systems. 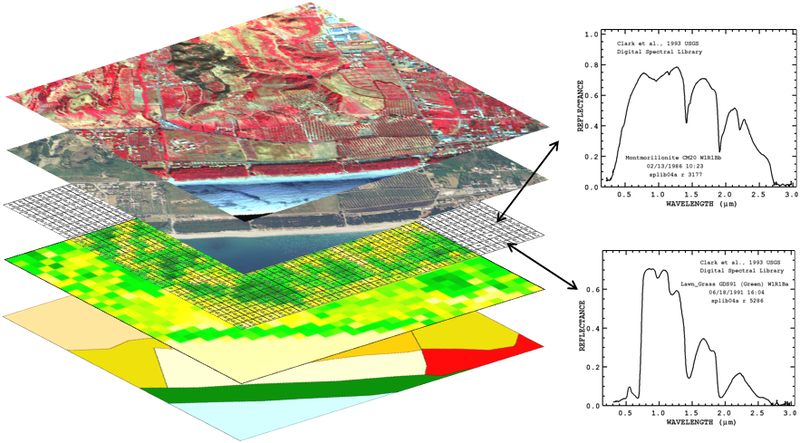 The research activities aim to develop methodologies for the interpretation and integration of multi and hyperspectral optical imagery, radiometric measurements of field and environmental data in order to expand the knowledge of natural or man-made phenomena that can modify the territory. As part of the Institute’s activities, it has always been the need to make information easily produced actionable information that can be used by users with different needs (researchers, policy makers, stakeholders) and interfaced with computer systems with complex architectures. Full accessibility of information has been achieved through the development of interoperable systems. An interoperable system is such that when it is able to exchange information or services with other non-homogeneous systems or products, in a more or less complete and error-free, with reliability and optimizing resources. This system makes use of standard communication protocols, storage, cataloging and export of services related to such information, or through a disambiguation of semantic content of concepts and through the application of a controlled language and shared. The Thematic Group is born, then, with the aim of developing methodologies and conceptual and technological tools to support the Institute’s research activities making it fully interoperable baggage of information gathered as part of projects, measurement campaigns, laboratory investigations. ESSI-lab operates a line of research on inter-disciplinary approach between Information Sciences and Environmental Sciences for development of computer models and tools for the Environment and Earth Observation. In particular, for applications characterized by a marked multi-disciplinary approach’. These applications are directed to the Company (the research community, public administrations, citizens, etc.) With particular reference to the “Societal Benefit Areas” and “Community of Practices” identified international initiative GEO (Group on Earth Observation): Disasters, Health , Energy, Climate, Water, Weather, Ecosystems, Agriculture, Biodiversity, etc. The research focuses on defining models and services for power generation distributed systems, processing and sharing of resources to different levels: data, information, knowledge. Objectives pursued in part by the European Directive INSPIRE and SEIS Communication from the European Commission. The activity is therefore fully aligned and contributes both to these European and international initiatives, to other similar such as EGI, GMES, etc.. The important cultural role and research done by ESSI-Lab within the CNR have been recognized by the Department of Earth and Environment who called him to coordinate an interdepartmental project CNR called GIIDA (Integrated and Interoperable Data environmental CNR). GIIDA also became one of the research topic of the Department of Earth and Environment of CNR. Recently, ESSI-lab was also involved in the Working Group for the design and implementation of a computer system for the management and dissemination of PNRA polar data; Group scientifically coordinated by Stefano Nativi from ESSI-Lab. The laboratory has established and tested an innovative approach to interoperability multidisciplinary called: brokering approach. GI-cat is an implementation of a discovery broker can: a) make the discovery and evaluation of geospatial resources into a federation of heterogeneous information sources for interface and data models and metadata; b) publish a catalog different interfaces supporting diversified client. It currently supports over twenty specifications of the catalog / inventory from standard and Communities-of-Practice to connect sources of information, and is able to present eight different interfaces to the client. A Accessor Development Kit (ADK) is provided to extend GI-cat to other types of information sources currently not supported. GI-Axe is an implementation of an access data broker that provides access and harmonization of datasets collections provided by download services and heterogeneous access to interface and data model. The dataset collections accessed through GI-Axe is provided on a Common Grid Environment (same Coordinate Reference System, same resolution, same size, etc.) By means of transformation services (subsetting, resampling, interpolation, projection, etc. ), Implemented locally or exposed to external web services. GI-Dac Discovery Augmentation is a component that allows you to enrich data discovery capabilities and geospatial services through access to external semantic services (thesauri, ontologies, gazetteers, etc.). Accept incoming query semantics and semantic accessing external services, it can expand it into multiple traditional geospatial queries. GI-go Desktop is an application that implements the client functionality to geospatial services supported by GI-cat. In addition, it implements all additional interface features extensive GI-cat. It also allows to interact with the GI-ax for access to harmonized data. GI-Portal is a web application that implements the client functionality to catalogs using as OpenSearch service interface. In addition, GI-Portal is able to interact with other ESSI-Lab products (GI-ax, GI-Dac). Most of these components have been used in a framework developed within the European project EuroGEOSS, and have become an integral part of the GEOSS Common Infrastructure (GCI). GEOLAB is engaged in research activities to study and develop methods and products in the field of geomatics understood as the study of the information with geo-referenced component. The activity phases consist of storage, processing, transmission and sharing. In this context, the laboratory studies the integration of its software engineering methods, often used in different fields by e-Science, in order to build systems geared to the management of geo-referenced data. This integration allows for interesting functional results through the use of Web technologies borrowed from areas other than academics. The activities of the Laboratory, is also geared to making accessible the processes of integration of the data in geomatic platforms, developing interoperable systems and products that make use of more complex spatial components approachable even for different scientific skill operators. Products GEOLAB is developing two types of products, highly integrated. GEOINT is an information platform, developed in order to realize a collection of services for the integration of geographic data in a Spatial Data Infrastructure (SDI) and to make these services more accessible in terms of ease of use, to end-users. To this end, the services are currently exposed through a web interface. And ‘it is built the web service interface. It is therefore a platform that wants to take charge of their duties integration of geographic data in an SDI. In addition, the platform serves as a base for other IT applications in geomatics that can be developed on the basis of the services exposed by GEOINT. Among these services it has been developed SoSDataLayer, a web application that handles data from SOS sources, the OGC specification for data from systems SWE (Sensor Web). SosDataLayer allows, through a web interface to search and analyze data from sensors and exposed through specific O & M services through SOS. The system is fully integrated into GEOINT and exploits the services both in terms of geomatics that of computational resources. EKOLab (Environmental Knowledge Organisation Laboratory) conducts its research activities in the organization of environmental knowledge and geographical. The activities include the construction and development of mono- and multilingual thesauri and systems for the collection, organization and display of environmental information and geographical. The thesauri are controlled vocabularies and dynamic terms, in which they explained the relationship (hierarchical, associative and equivalence) between terms. They are tools for the semantic control of the language and can be used for indexing, cataloging, classification and retrieval of information in the bases of environmental data. The EARTh bilingual thesaurus represents a constantly updated tool both structure and content; It is based on a system of hierarchical / thematic matrix where the standard reports were organized into subtypes in order to improve both the semantic control both the indexing and search functions. The general thesaurus are flanked by two thesauri developed for particular topics: SnowTerm, a multilingual thesaurus on the environment snow and ice and EOSTerm a bilingual thesaurus related to the field of Earth Observation (remote sensing and GIS). As part of its activities, the Group contributes significantly to the Group on Earth Observations (GEO), which aims at building a Global Observation System of Systems (GEOSS) to allow the progress of some areas of society. In particular, the expertise of the group have developed in the design and implementation of a national SDI air quality (GIIDA), a SDI relating to pollution of the Mediterranean Sea (AEGIS and KNOWSEAS) and are derived from the work done in ‘field of the task He-09-02d GEO dedicated to developing a comprehensive system of monitoring of mercury (GMOS). The thesaurus EARTh is used internationally in NatureSDIplus project at national level by the Istituto Superiore Environmental Protection and Research (ISPRA) and is the reference terminology in GIIDA project. The know-how of the group is demonstrated by the numerous institutional interactions (UNEP, FAO, GBIF, Ecoterm, ISPRA). The many applications developed support the implementation of GEOSS and the research focuses on defining models and services for power generation distributed systems, processing and sharing of resources to different levels: data, information, knowledge. Objectives pursued in part by the European Directive INSPIRE and SEIS Communication from the European Commission. The activity is therefore fully aligned and contributes both to these European and international initiatives, to other similar such as EGI, GMES, etc..
Technical and scientific consultancy, when requested by the Ministry of Education, University, public agencies, companies, or other private entities. These activities are also undertaken in an effort to achieve one of the CNR’s objectives: the application, and transfer of technical/scientific knowledge in drawing up and implementing the environmental legislation in national, European, and international contexts. With this assumption, the Institute offers its know-how to the stakeholders and, in particular, to the public administration. Transferring, sharing, and disseminating of the acquired experience. To transfer and to apply the scientific and technical knowledge, skills, and “sensibility” acquired by the different skills of the National Research Council (CNR) (in particular of the IIA), in making and implementing the environmental legislation in national, European , and international contexts. To support the public administration to improve the preparation and implementation of environmental legislation. Moreover, the transfer and application of technical and scientific knowledge in drawing up and implementing the environmental legislation can provide, inter alia, technical standards better to apply, also in terms of reproducibility and specificity; as well as to give rise a process of improvements, both in terms of effectiveness and efficiency, as in the applicability of the standards themselves, allowing simplification and harmonisation. providing technical and scientific expertises. The current development model establishing the uncontrolled use of non-renewable sources generates strong pressures on the ecosystem, creating social inequalities and influences on the political stability of many countries. In order to react to these changes it is necessary to develop a new less expensive production and consumption energy systems, able to reduce environmental impact and waste generation. The need for a transition based on the use of renewables and low environmental impact technologies is particularly important in rural areas where the deterioration of environmental resources is an important issue; in such contexts the potentiality for improvements are very important, considering the existing low-productivity index especially in poorer areas. This necessary transition can be achieved with better management of energy and natural resources, especially through the production of energy based on biomass and the residues of agricultural production. In fact, among the various sources of energy, the sustainable use of forestry origin biomass together with agriculture and animal waste are a very high energetic and technological potential resources. The benefits the use of bioenergy can provide cover not only the environment, but also the economic and social structure that benefits from a reduction in production costs and in waste disposal costs. The research activities of the CNR-IIA bioenergies group are focused on the design and development of technologies with reduced environmental impact and on the transfer of knowledge to the rural world. The research activities of the CNR-IIA bioenergies group are focused on the design and development of technologies with reduced environmental impact and on the transfer knowledge to the rural world.